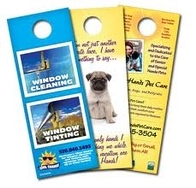 Door hangers are one of the best ways to promote your business, especially when currently working in an area. By simply walking the neighbourhood and attaching these to the doors, you not only seperate yourself from all the mail, but you don't disturb anyone by knocking! We usually provide 2-3 day service on digital door hangers. We can also provide a business card tear away on any of our door hangers! These extremely high quality door hangers take approximately 2 weeks to produce.